Founded in 1986, CentroNia is a multicultural learning community in Washington D.C. with a pioneering approach to bilingual education. Their holistic approach ensures that children receive support and encouragement they need to succeed academically, develop a strong sense of community, and live healthy and active lives. 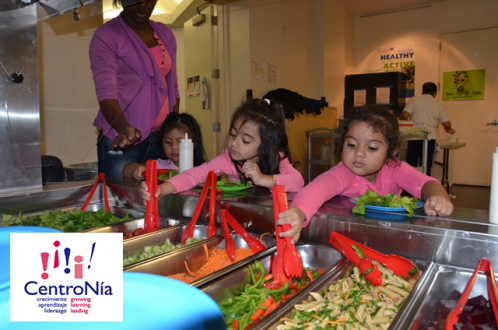 At CentroNia, they also believe children and families must have the proper nutrition to be best positioned to learn. Through tasty and nourishing meals they seek to inspire children to maintain healthy lives. For the earliest learners, each day starts with a wholesome breakfast, including: fiber-rich whole grain toast or granola, fresh fruits packed with vitamins, milk for strong bones, and a probiotic yogurt to aid digestion. In order to have an attentive classroom, bodies need to be nourished and energized for the day’s activities—especially since there will be lots of movement and games throughout the day. At lunch, teachers sit at a table with the children where they can be overheard coaxing the kids to “try ‘un poquito’ to see if you like it”. On the table sits a jug of milk, a bowl of fruit, and an entree that they pass around the table in “family-style.” Children also visit a salad bar, an exciting new addition to lunchtime for Pre-K, and make their own healthy creation using the selection of fresh, seasonal produce. CentroNia also embraces its multicultural community when creating the monthly menu by incorporating many cultural influences; for example, each month has an international day highlighting a country or region. “We introduce vegetarian meals on Mondays each week and also serve fish once a week. This allows children to experience a variety of options and encourages them to be more adventurous with food choices,” said Bea Zuluaga, CentroNía Director of Food and Wellness. The quality of food and its sources are the foundation of the menu. Understandably, providing healthy meals is not always an easy task and they are fortunate to have access to local farmers during peak seasons. For centers seeking to improve their menu, Zuluaga advises starting with small changes that are easily adjustable. Some of these changes could include swapping juice for water, incorporating whole fruits into snack times, and instituting a ban on ‘junk food’ for the center. Leading by example is equally as important as providing healthy meals, so it’s important to ensure everyone in the community is on board. In April 2015, two children from CentroNia represented Let’s Move! Child Care at a Let’s Move! Gardening event at the White House. At the event, children helped plant vegetables in the White House Garden with the First Lady. The nutritional value of meals depends on careful menu planning. This resource from CACFP looks at how to successfully plan healthy, appealing meals. It also covers family-style meal service, managing staff and equipment, and food ordering and purchasing.